The convenience of digital editions is great. I've had no problems accessing issues I've paid for. I enjoy the simplicity of the app and think that makes for a better reading experience. However, the app does not save your place!! If you leave the app for too long, or at all on older devices, it closes the issue you're reading and the next time you open the app, you're back at the home screen. Then you have to open the issue back up and go back to where you left off. So be sure to pay attention to the page you're on if you're going to close the app! This is, in my opinion, unacceptable for a reading app. Please fix this! The app works fine, but the UI is in desperate need of an update. A text only view for articles would be a huge help as well. Very disappointing! Program crashes every time I delete an older issue or load multiple issues. Today I had to delete and reinstall the program when it wouldn’t let me delete 2013 issues to free up a little space on my iPad. When I tried to reload current issues, it crashed again with the 4th issue I tried to load. I’ve had the same problem since I first subscribed in 2012, despite claims that the problem has been fixed. With so many excellent magazine apps out there (e.g. National Geographic, The New Yorker) I don’t understand why they can’t fix this. I’m so happy this app works again! Sky & Telescope switched to a new platform to view issues. The new platform refuses to recognize my subscription. S&T was made aware of this problem over the summer and continued to support the old platform for a few months while this was being addressed. Now that is no longer an option and Zinio hosting them now refuses to recognize my subscription. S&T refuses to assist as I’m an iTunes subscriber. To me that’s a rather unacceptable position for them to take. iTunes shows my subscription is valid and refers me to S&T. Zinio has been show a screen shot of my subscription being valid and I still have zero issues. They’ll probably eventually resolve this. However it was a known issue months ago so it must not have been much of a priority. Until all parties involved stop pointing fingers at each other I’d steer clear of a digital subscription. This has been a waste of time and money. I've had the app for a year now and I think I was only successful with being able to open 3 issues. At first it would take multiple login attempts to view the magazine. Now nothing I try will open them. The app asks for my email and password, which it says it doesn't have on file and gives me a link to the publication company to restore it. When I ask them to fix it they ask for my address and 16 digit code on the mailing label of the magazine. When I explain to them I don't get a physical magazine in the mail (it's through iTunes) they tell me they don't deal with that. So I basically gave them money for nothing. The previous version of this app did not work ether and took a long time to fix and when it started working it was slow and just got passed useable. Updated app came out and I got it and it all went wrong!!! My password would not work, lost all my back issues, new issues only get the ads no content, support well waste of time send me to another app that doesn’t work ether. Subscriber apps in digital magazine world seem to be a problem why I don’t know Sound easy download magazine and enjoy not the case, that’s to bad no joy and no help! App used to work OK but it has not worked at all for months. Closes immediately after opening. Extremely frustrating. 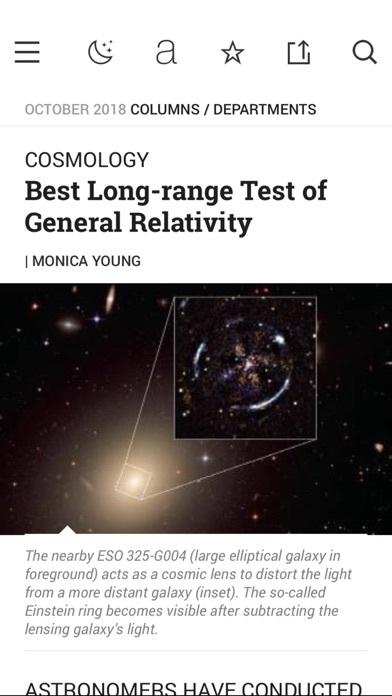 It is a shame because S&T is a great publication. Do not spend any money for this. I have many issues downloaded on iPad and I cannot access them. Developers need to get their act together. I can’t see any issues on my iTunes subscription anymore. Totally worthless. After months of a broken app, I have finally been able to download current and back issues! A reviewer echoed my thoughts in feb review. S&t should be embarrassed. Guess I still need to get the paper copy. I finished the paper August issue . They sell the PDF of it. Still not posted in the app I intend to let my subscription expire until they are serious about furnishing an electronic version Revised app does not recognize my subscription. Guess they do not want my business. The app crashes at random and that's when it actually opens, which is probably about 1 in 30. Now I've been going through the nightmare of trying to get a refund but they don't seem to have records of it since I purchased through their app. Don't recommend. This S&T app crashes within thirty seconds of starting. It has been doing this for the last few releases of IOS. I have deleted and reinstalled several times. No luck. Apple - Make an example of these guys and remove them from the App Store. Astronomy Magazine here I come. How does Apple allow this in the App Store?!! This app has always been bad. However, the magazine itself has good content, so I was able to overlook the many annoyances of the app. However, with the recent “upgrade”, they no longer recognize in-app purchased subscriptions ($37.99/year). They, of course, are willing to take your money, but good luck restoring any purchases. I lost multiple years worth of back that I paid for. I’m so furious. That Apple allows this practice to occur in the App Store is a travesty. I have been a digital subscriber to Sky & Telescope through iTunes for many years. I never had any problems with the previous app. Since the update to the current app I completely lost my access - despite having a valid iTunes subscription. The “restore purchases” feature does not work and customer support does not reply to any inquiry. Given the complete lack of communication and apparent disregard to customer problems I am deeply concerned that I may have fallen victim to a fraudulent operation. I just got dinged for my subscription renewal and none of my issues are accessible. Update: the iPad seems to have accepted what looks like an earlier version of the app after the most recent one was deleted. Issues of the magazine can be read. No such luck on the iPhone, but maybe that will be fixed. I have been a subscriber to the magazine for decades but this app isn’t good. Apple, do something if you want my business! Supposed to be free except for in app purchases. What a laugh! After you d/l the app, that's it. Pay or leave. Better yet, don't waste your time. App never works correctly, can't download issues, can't do much of anything. App crashes when opened. This app is an embarrassment and should be pulled from the App Store. Latest update (2/7/15) purports to fix crashing issue. Nope. Does anyone from s&t pay attention to these reviews? App says it no longer recognizes the login info that I have used for a long time. Can't get in. I give this app 1 star because I can’t give it zero, and I’d give it zero because it STILL doesn’t work. For many months it hasn’t worked at all — and it still doesn’t, at least as far I can figure out. Sky Publishing used to be a strong organization but several things lead me to conclude that they’re really adrift these last few years. Sad. After installing the app it doesn't show up on my iPad. No matter what I do I cannot get it to display. It's Horrible! Just Horrible. Don't waste your time. If you want the magazine save yourself a lot of grief and purchase the paper edition. Lost all my issues after the update! Did restore purchases many times. Very frustrating! I’m glad I canceled my subscription months ago but still want the issues I paid for!! I also bought most recent Nov issue and July issue and can’t access. I wish I can give zero stars because I got zero for my money. Will never come back. Will stay w Astronomy and BBC Sky at Night although their Apps are not much better but at least I have not lost my issues that I paid for. Thanks! I paid for a renewing monthly subscription, was charged 2x at the monthly rate stating in May. The July edition was out that day. Here it is July 4th and this is the only issue that shows in this lousy app. Paid for 2 months for 1 edition. If the August edition doesn’t become available until after I can go buy it at the store not worth the cost and who knows if another edition will ever show up. Canceled today as still have not seen the August edition show up. Waste of money and no way to contact anyone about what’s going on. Might try the kindle edition or directly from the publisher, but this app is a money trap. Be warned! Great magazine, app needs an update. 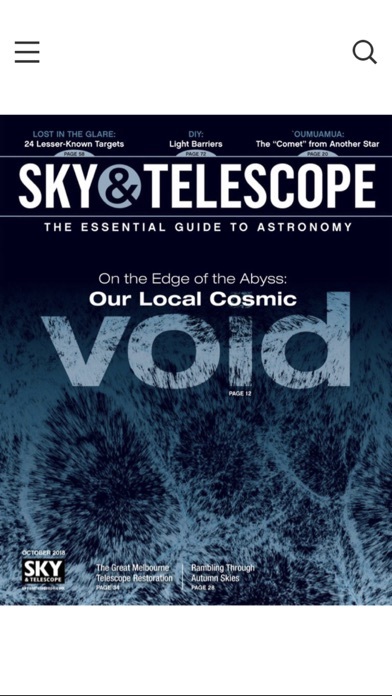 I love Sky and Telescope magazine and have subscribed for many years. No issue there. My critique is for the app, which has at least (for me) one very annoying bug: On my iPad Air under iOS 11, if you attempt to open the app without an internet connection, say on an airplane, it will crash, repeatably. Opening the app with an internet connection is no problem. The best workaround I’ve found is to launch the app while still having a connection and open an issue prior to boarding the plane, but even that does not always work if too much time elapses. Really annoying! While I’m not 100% sure this behavior began with iOS 11, I believe so. The app could really use an update! My subscription is still active but after the update I can access neither new issues nor any of the issues I had already downloaded and read. The switch to “Zinio-powered” is a mistake. 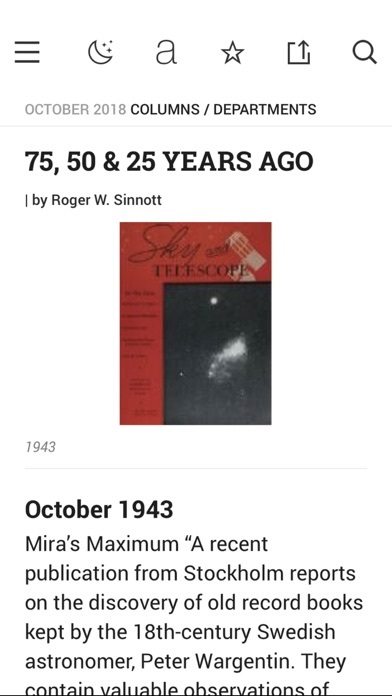 S&T laments that its average readership is aging. Not being able to provide a high quality electronic edition (which is what younger readers expect) only accelerates this trend. I've been a subscriber for decades and was excited when the electronic edition debuted a few years ago. Unfortunately, the e-edition has not been maintained and it appears the publisher has abandoned this effort as it does not seem to properly work on iOS versions later that 5.0. A missed opportunity to expand readership to younger audiences. I fear this is the beginning of the end for this once storied magazine. All back issues deleted, restore purchases does not work, so I can read absolutely nothing. Apple refuses to refund the subscription, Sky & Telescope says talk to Apple, link to app developer does not work. They take your money and keep it while delivering nothing. The app and the experience of trying to set things right could not be any worse. A scam and a rip off. Good magazine. Extremely poor application!! Just subscribed and they subscribed me for the previous year? Sky and telescope support could do nothing except take my money. No fix as yet. Have had an iTunes subscription for several years to Sky & Telescope but this version of the app not only won’t recognize my existing subscription but won’t allow me to download any back issues I’ve already paid for. I’ve tried all the app tricks, delete and reload, sign out and back in, etc. Hey magazine publishers: this not how you stay in business! New Track Media needs to get their s*** in order. The new app is a full blown mess, sad to say goodbye to Sky & Telescope after 33 years. Nothing more to add to this sad state of affairs!!! After MANY unhelpful, canned emails from customer support telling me how to “fix” the access issue, I finally realized two things: 1) they are not really reading the problem reports I’m sending. Their suggestions are pulled from a standard, useless list of actions such as “reinstall the app” “redownload your subscriptions” etc. 2) they have no idea how to fix the problems and haven’t tested it themselves. For those who try this app in spite of the terrible reviews. I suggest you not plan to read subscriptions without a free WiFi connection available. As soon as you lose access to the web, the issues will disappear or refuse to open. The workaround is to go to a browser and download the issues to a pdf file for offline access. Very clumsy. I had several years’ worth of issues downloaded, and when the app updated they all vanished. In order to get anything back, you need to sign in and re-download; “restore purchases” just gives an error and does nothing. The problem is only a year’s worth of issues show up as available (back to March 2017). I’ve emailed support about getting all the rest of my paid-for issues back and will update this review if and when I receive a response. For now though, I’m happy I can at least keep reading the current issues. I subscribed through the app,and it doesn't work. $37.99 gone. It says I'm not subscribed. I can't even find a way to get a refund from the publisher. Best content, best magazine app, and world class customer service. If you have even a casual interest in astronomy, I strongly recommend this app. Keep up the great work! I'm a digital subscriber to S&T. When I saw that they FINALLY released an app to read the magazine, after several years of navigating PDFs, I was excited to download and start reading. Alas, the app does not allow me to login. I enter my credentials, click "Login", and the app does nothing but grey out the login button. Nothing else happens. Would love to use the app but, as is, it's worthless to me. First it wouldn’t recognize my subscription and now it won’t download articles. Worst app in the iTunes Store. Has been consistently bad for years and gets worse every time it is upgraded. -1 of 5 stars. I can no longer access a few years worth of magazines. I have emailed support, but never got a response. I may not be a current subscriber, but I should be able to access the magazines when I was one. I hope S&T goes out of business because they care nothing for their subscribers, they just want your money and their magazines where filled with ads anyway. They still send me letters in the mail telling me to “act now” on some terrible deal for their magazine. I plan on throwing out my physical collection soon after this. Been having problems with this app for the past few months. Sent emails to support and they were slow and said they are aware of the bugs. This update unfortunately is still poor. 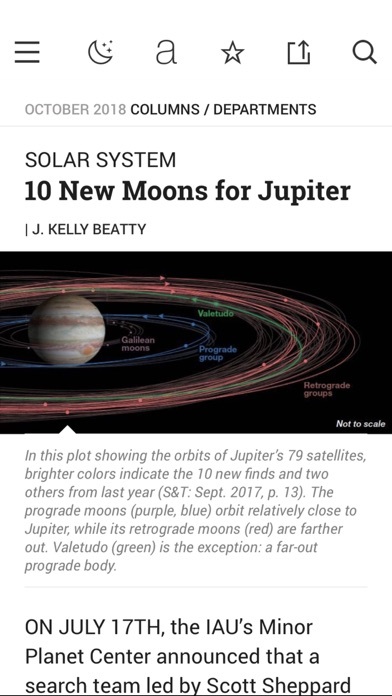 Spend your money on Astronomy magazine that app works!!! This is an excellent magazine! Good writing, good choices of coverage, more content than some, fantastic photographs of our beautiful Universe! I've bought several back issues through the app, and the app is easy to navigate. I saw an offer on their website a few minutes ago to subscribe to their digital edition for $14.95 for a year (80% off). But I wanted to do it through the app and Apple so I checked the app. Same digital edition but twice as much money at $37.99. Just for fun I went back to their website, and now, the same digital edition was $29.95. THREE DIFFERENT PRICES IN A COUPLE OF MINUTES. 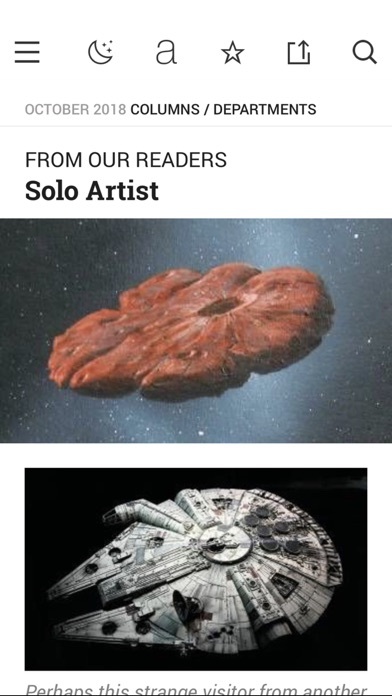 So, I did NOT subscribe. If they ever offer $14.95 through the app, I'm in. Updated to the new app. Now I have to download my library AGAIN. Do you know how long that takes? So after days of a message that says my purchases are being restored, I still have nothing. Why couldn’t you guys leave well enough alone? I downloaded the app and purchased the yearly subscription since February 2014 through iTunes. The app is not recognizing my account info and not able to login to download the latest issues. I have been in contact with customer service and they can't find my subscription, even when I sent them a screenshot of the most recent subscription payment with the transaction number, they are still NOT able to help me... I don’t know what kind of fraudulent business they are running but I am VERY DISSAPOINTED. FIX MY PROBLEM NOW! When the app updated to 3.0, I was no longer able to view any of the issues I purchased. Restore purchases does not work. I have let it sit on that screen for up to 30 minutes.